Items can be duplicated if you possess both the Staff of Worms and Skull of Corruption; see the Glitches page for details. When inactive, reanimated NPCs act as if they were alive. This can prompt reanimated guards to attack the player if they put on the Gray Cowl of Nocturnal. Also, reanimating a character that was killed by other NPCs in a quest (e.g Glarthir if you informed the watch about his murderous intentions) will cause any NPCs in the same faction to attack the reanimated NPC. This is one of two ways to acquire the Reanimate effect. 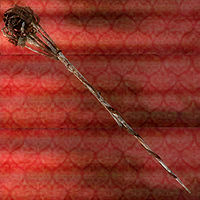 It is possible to use this staff to repeatedly harvest Vampire Dust from the corpse of a vampire. Simply kill one, harvest its vampire dust and reanimate it. When you kill the reanimated vampire again, it will have another piece of vampire dust on its body. You can repeat this as many times as you like. The reason for this exploit is that Vampire Dust only appears in the inventory of a vampire once it dies. Reanimating and killing a vampire counts as the vampire dying, which generates another piece of Vampire Dust. You can use this exploit to become very rich by selling all your acquired Vampire Dust to the Order of the Virtuous Blood. After using the staff to reanimate an NPC, it is possible that their eyes will permanently become a navy blue or purple, even in save files before the NPC was killed. This may be fixed by either resting or fast-travelling. NPCs will sometimes be invisible after reanimation although their name will still appear if you stray over them. When they die they will appear several feet away or in odd places such as part-way through walls. Looking straight up in the sky (or ceiling, if you're inside a building) will usually fix this. NPCs may also refuse to follow you through doors to the outside. If the NPC is a vampire, it may be caused by them not wanting to take sun damage; if this is the case, waiting until nightfall will solve the problem. Otherwise, simply move away from the exterior part of the door and some of them should follow you. If not, re-enter the building and move the bodies closer to the door before reanimating them and then follow the above instructions. If it still fails, there are two things that could be happening: the bodies still aren't close enough to the door or their AI prevents them from leaving the cell. It is possible to Reanimate NPCs that by default have 0 health, but they will not follow the player. They will die from any damage done.